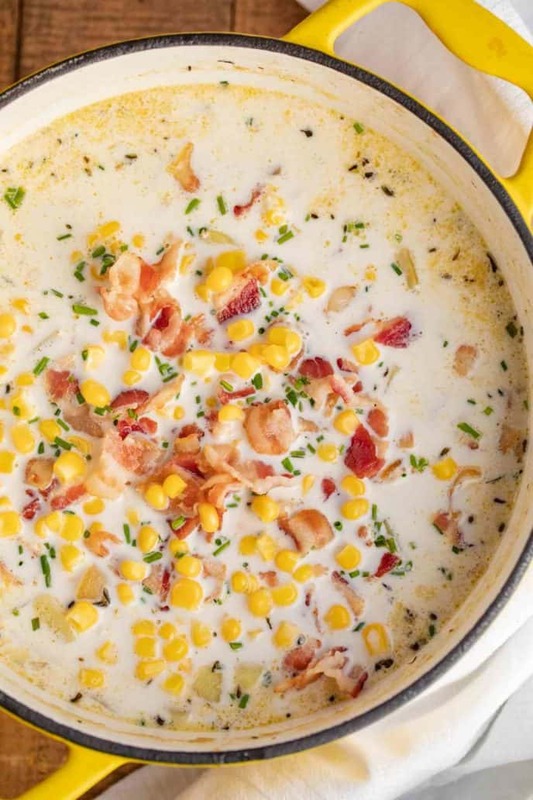 Corn Chowder is hearty and creamy, made with potatoes, half and half, and sweet corn, then topped with thick cut bacon, ready in 30 minutes! It’s comfort food season, and our kitchen is busy whipping up some of our classic favorites like Slow Cooker Beef Chili, Ultimate Slow Cooker Pot Roast and Ultimate Garlic Pork Loin Roast! Corn Chowder is thick and creamy, made with fresh corn kernels, potatoes, and half and half in a seasoned broth. 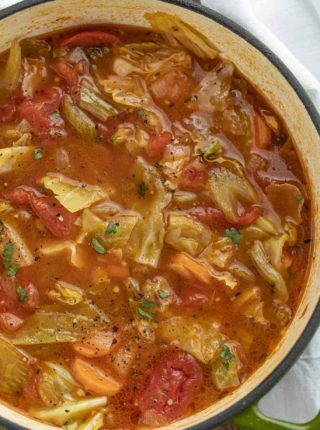 It’s the PERFECT comfort food for cold weather because it’s really hearty and filling. I make this at least a few times a month during the winter. 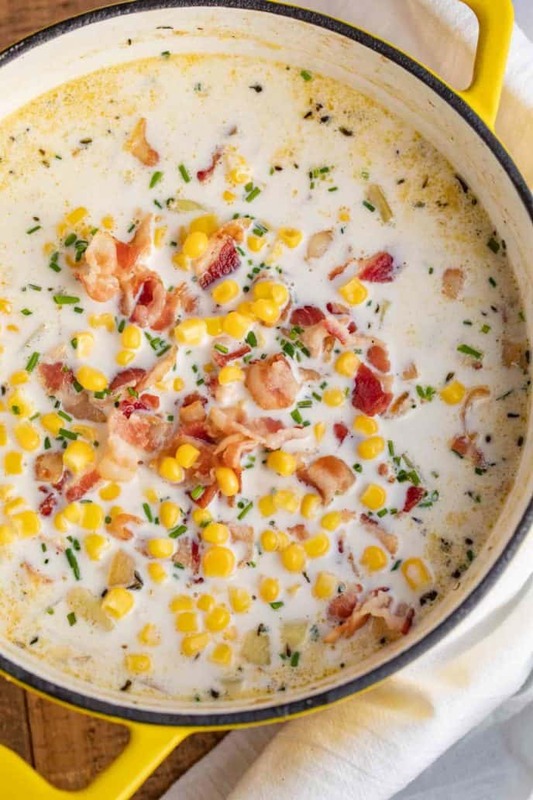 This corn chowder recipe has a creamy broth with big chunks of vegetables and bacon. 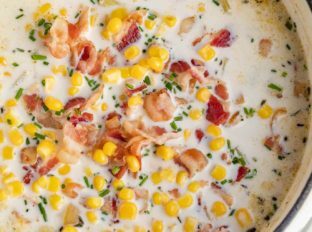 If you want a creamier corn chowder, add 2-3 tablespoons of flour to the bacon grease and onions after you remove the bacon. Whisk for 1-2 minutes until the flour starts to brown, then add the half and half, whisking to combine. Then follow the recipe as written, adding more broth until you reach a desired consistency. You can also whisk 2 tablespoons of corn starch in with the cold broth before you add it to the chowder. As the broth heats, it will thicken the soup. 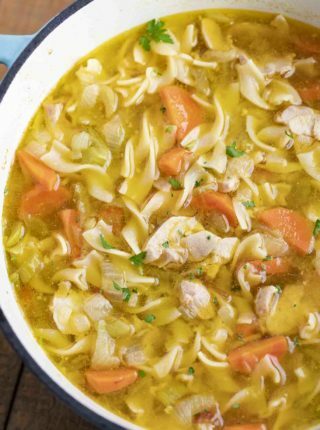 You can add more or less corn starch and broth to reach your preferred thickness. A third option would be to take the immersion blender and cream the soup to your desired consistency. When I do this, I usually reserve some of the cooked vegetables on the side to add back in at the end, and top with bacon right before serving. HOW LONG IS CORN CHOWDER GOOD FOR? Corn chowder will last 3-4 days in an airtight container in the refrigerator. Add all ingredients to the crock pot, except the half and half and the bacon. Cook on low for 8 hours, or on high for 4 hours. When the chowder is about a half hour away from being done, stir in half and half. In a skillet cook bacon until crispy and cut into pieces. Top with bacon and serve. Use the sauté feature to cook the bacon, then the onions until translucent. Add all ingredients except for the half and half or the bacon to the instant pot. Close the lid and seal the valve. Use the manual setting on high for 10 minutes, then let release naturally. Once the pressure is released, open the pot and stir in half and half. Top with bacon and serve. This recipe has potatoes and dairy, so freezing it may make it more mushy and cause some of the milk to separate and become grainy when you reheat it. 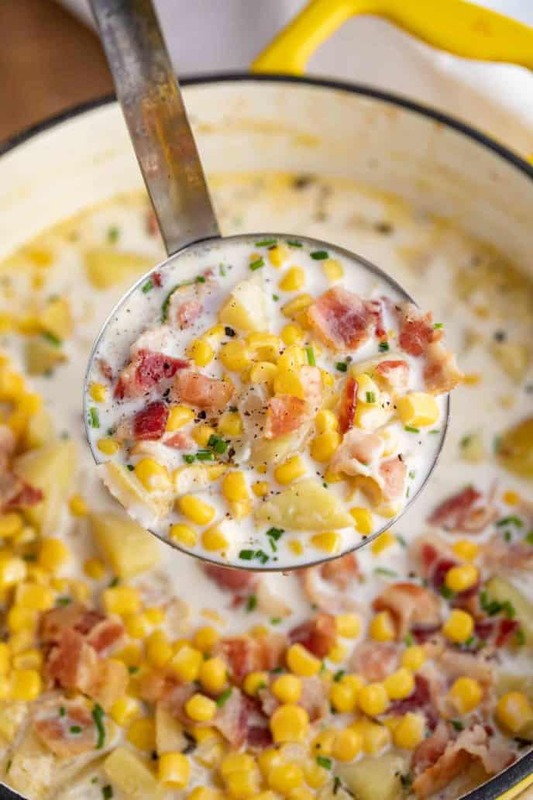 If you want to make this corn chowder recipe ahead and freeze it, I would stop before the potatoes are completely cooked through and wait to add the half and half until you’re reheating it. WHAT OTHER VEGETABLES CAN YOU ADD TO CORN CHOWDER? Add a sprinkle of cheddar cheese to the top of the chowder for extra flavor. 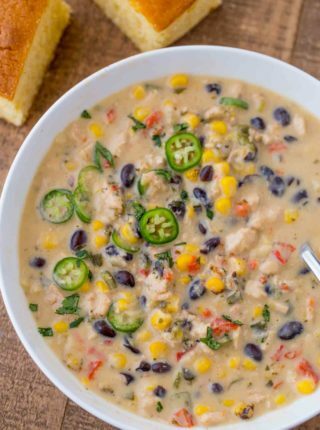 If you want to add some spice to this corn chowder recipe, add 1/4 teaspoon of cayenne pepper and chopped peppers. Top with sliced jalapeños. You can use canned corn, frozen corn, or cut the kernels off of the corn cob yourself for this recipe. Serve with crackers or a warm slice of buttered bread or corn bread. Add the bacon to a large dutch oven on medium heat and cook until crisp, removing the bacon and reserving two tablespoons of bacon fat. Add the onions to the the pot and cook for 2-3 minutes before adding in the salt, pepper, broth, potatoes and corn and bringing to a boil before reducing to a simmer and cooking the potatoes for 20 minutes until they're tender. Add in the half and half, heat through and serve topped with the bacon crumbles. I made this over the weekend and it was delish! Will be making it again. So glad you enjoyed it! Thanks for the 5 stars. Wow! 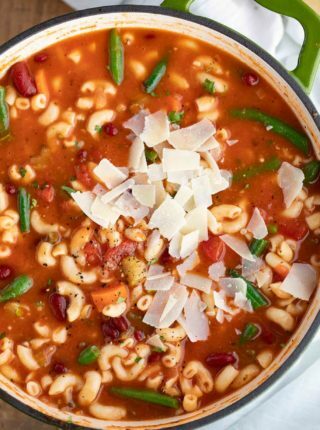 Made this soup yesterday in the slow cooker and it was great. I added some carrots and a tomato just because I had them and some roux at the end to thicken, Will make this again for sire. Thanks for the recipe. You’re welcome, Samuel! I’m so glad you loved it. Was wondering if you could sub 1 cup 1% milk and 1 cup cream for the half and half – don’t usually use cream but have some on hand and want to use it up.